Ever since I heard about the death of our beloved Kevin Smith, better known as Ares, the god of war in Xena: WP, I can only describe what Ive been feeling as total shock. It is incredible that one of the pillars of the show has passed away. Ares was a character that was loved and hated, but the role it played on the series and the impact it made development of the characters was immense. 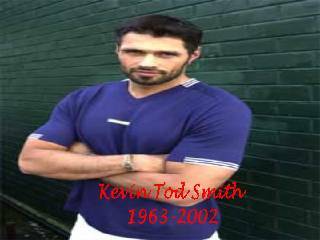 So it has broken my heart the fact that Kevin Smith has died. He had a huge fandom in the Xenaverse and from what Ive heard he was an exceptional man. What makes his death such a shock is that he was a young and healthy man who was full of life, so his sudden death doesnt make sense. He left behind a wife and three kids, whose lives are about to be changed completely because of his absence. To them and to the rest of his family and friends I offer my sincerest condolences, Ill be praying for all of you. Although I never had the pleasure of meeting Kevin it was a dream Ive always had, to meet the entire cast of Xena, I guess that now this dream has been shattered. Kevin was a great actor and was on the brink of a career breakthrough at the moment of his death since he was about to start shooting a movie with Bruce Willis. There will always be a corner in our hearts for Kevin who, for six years, played a character that we grew to love and hate. Wounds will heal and scars will fade, but his legacy will never be forgotten. This is my official phrase regarding his death, so youll see it around a lot: WELL MISS YOU KEVIN!!!!!! Kevin left behind a wife and three young children. So a fund is being organized by Robert (Kevin's agent), Lucy Lawless and Michael Hurst to help them through this time. For more information regarding Kevin's death and what's been going on around the Xenaverse because of it visit ForevaXena's Kevin's tribute page: ForevaAres. There you will find lots of links and information. To honor Kevin's memory I've prepared two special pages: one dedicated to Kevin and one to Ares. In each of them you'll find their biographies, a collage and other sort of multimedia that I'll be adding as time goes by. I hope you like it.